Exercise carries many positive effects on a person's metabolic state. Regular exercise helps to lower the oxidative stress in the body, to repair damaged endothelial cells, and to proliferate neural stem cells. Acute exercise plays a role in tissue repair and vasculogenesis, and may play a role in repairing damaged heart tissues. Aerobic exercise refers to exercise that generates energy through aerobic processes, such as distance running or calisthenics. Aerobic exercise carries benefits on endothelial function, which is important for the prevention of cardiovascular disease. Aerobic exercise has been shown to increase forearm blood flow (FBF) as well as forced vital capcity (FVC) in the lungs. 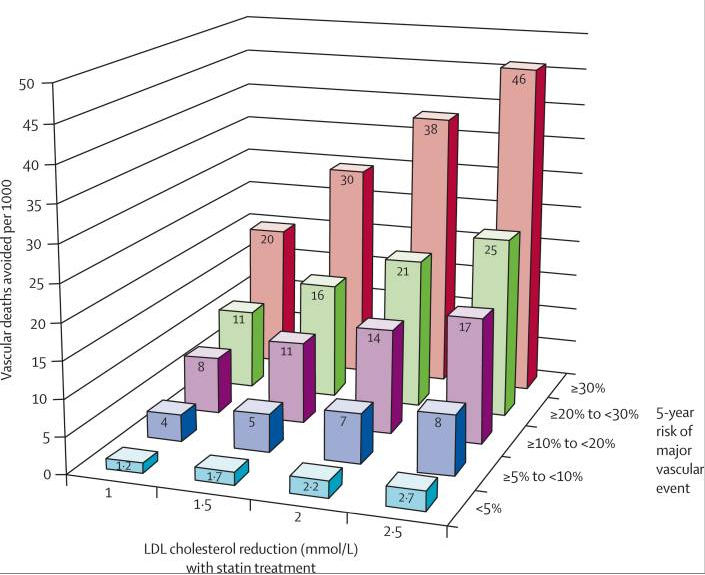 Another meta-analysis has shown that decreasing the levels of LDL cholesterol in an individual, even by as little as 2.5 mmol/L, can lead to 4.6% improvement in the vascular death rate on the population level. Resistance training refers to weight-bearing forms of exercise. This can take place in many ways including powerlifting, olympic weightlifting, barbell lifts, dumbbell lifts and compound exercises such as CrossFit. For most optimal effects, resistance training can be done multiple times per week (up to 4-5 separate workouts) but there should be adequate amounts of rest in order for recovery to occur. Resistance training breaks down muscle fibers, and muscle fibers recover and heal during periods of resting. During the healing phase, the muscle fibers undergo hypertrophy, which refers to an increase in size of the cells.9Muscle fiber breakdown is measured by the marker creatine kinase (CK). Resistance training increases levels of important growth factors in the body. Studies have shown correlations between resistance training and levels of brain-derived neurotrophic factor (BDNF), vascular endothelial growth factor (VEGF), and insulin-like growth factor-1 (IGF-1). A study involving 56 young men showed that resistance training induced various hormone responses including acute increases in serum growth hormone (GH), free testosterone, insulin-like growth factor (IGF-1) and cortisol. These rises in hormones were also correlated with rises in lean body mass as well as type 2 muscle fiber cross-sectional area, which are crucial to general health and metabolism.11In this study, participants did a 12-week long resistance training program; they did not engage in regular weightlifting activity for a period of 8 months before starting the study. 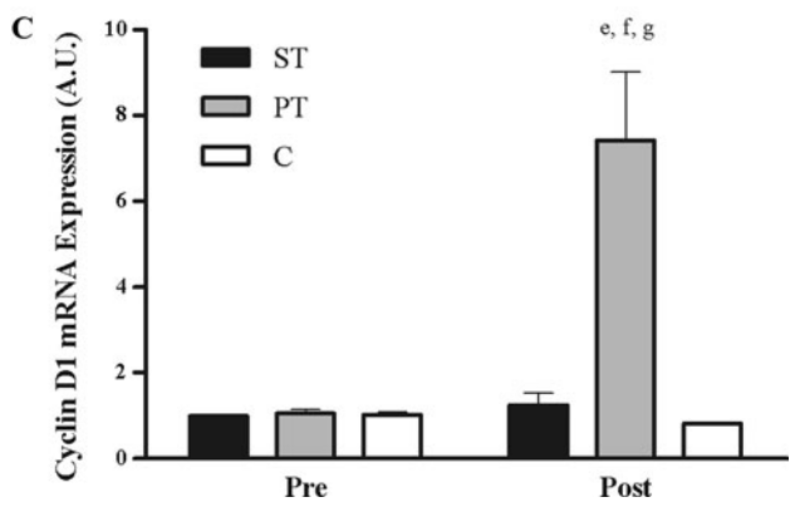 A study involving older men with an average of 68, shown that engaging in resistance training consisting of 3 sets of 10 repetitions of the leg press, hack squat and leg extension lifts, resulted in significantly lower levels of myostatin after 24 hours post-exercise.13Myostatin is a negative regulator of muscle growth, and generally it is better to maintain lower levels of myostatin in order to preserve lean muscle tissue for metabolic purpose. Resistance training has been shown to lead to decreased levels of myostatin. This is of particular importance to older individuals in order to preserve lean muscle tissue. 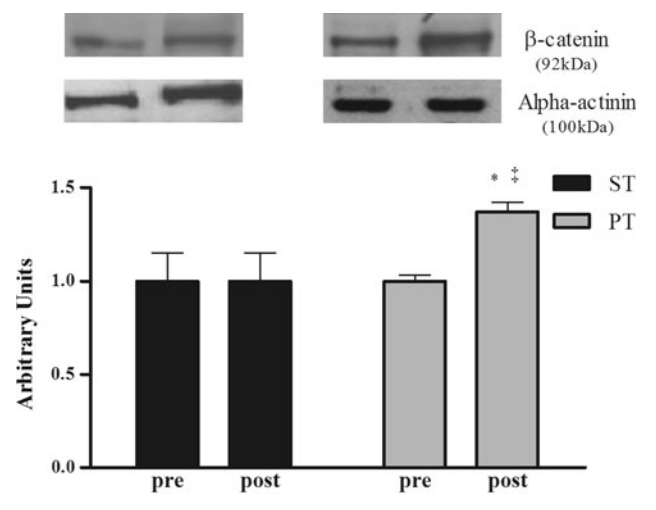 Power training leads to increases in levels of beta catenin, which plays a role in preventing protein breakdown. PT: power training - squatting a percentage of the maximum 1-repetition load, ST: strength training - squatting the maximum 1-repetition load. Strength training leads to increases in levels of Cyclin D1, which plays a role in cell cycle regulation for diseases such as cancers. The participant group that engaged in power training (PT - squatting a percentage of the 1-repetition maximum load) exhibited the greatest increase in cyclin levels. Green, D. J., Maiorana, A., O'Driscoll, G., & Taylor, R. (2004). Effect of exercise training on endothelium‐derived nitric oxide function in humans. The Journal of physiology, 561(1), 1-25. Walsh, J. H., Yong, G., Cheetham, C., Watts, G. F., O’Driscoll, G. J., Taylor, R. R., & Green, D. J. (2003). Effects of exercise training on conduit and resistance vessel function in treated and untreated hypercholesterolaemic subjects. European heart journal, 24(18), 1681-1689. Fiuza-Luces, C., Garatachea, N., Berger, N. A., & Lucia, A. (2013). Exercise is the real polypill. Physiology, 28(5), 330-358. Soga, Y., Yokoi, H., Amemiya, K., Iwabuchi, M., & Nobuyoshi, M. (2011). Safety and efficacy of exercise training after coronary stenting in patients with stable coronary artery disease. Circulation Journal, 75(10), 2379-2386. Trialists, C. T. (2012). The effects of lowering LDL cholesterol with statin therapy in people at low risk of vascular disease: meta-analysis of individual data from 27 randomised trials. The Lancet, 380(9841), 581-590. Kelley, G. A., Kelley, K. S., Roberts, S., & Haskell, W. (2012). Comparison of aerobic exercise, diet or both on lipids and lipoproteins in adults: a meta-analysis of randomized controlled trials. Clinical nutrition, 31(2), 156-167. Flann, K. L., LaStayo, P. C., McClain, D. A., Hazel, M., & Lindstedt, S. L. (2011). Muscle damage and muscle remodeling: no pain, no gain?. The Journal of experimental biology, 214(4), 674-679. Rojas, V. S., Knicker, A., Hollmann, W., Bloch, W., & Strüder, H. K. (2010). 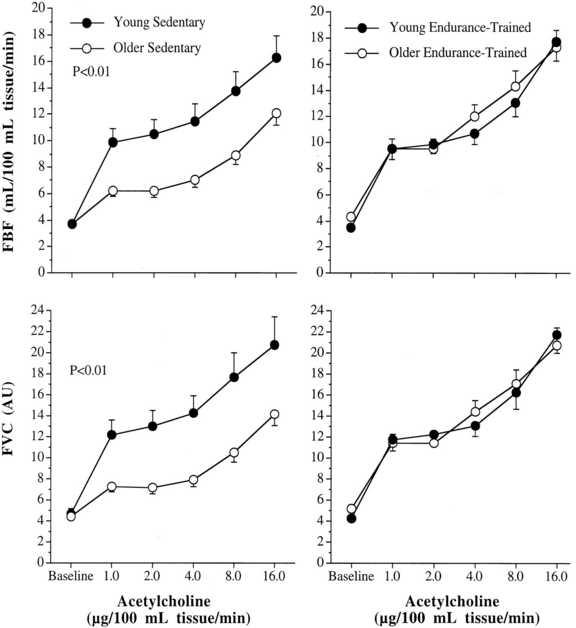 Effect of resistance exercise on serum levels of growth factors in humans. Hormone and metabolic research= Hormon-und Stoffwechselforschung= Hormones et metabolisme, 42(13), 982-986. Daray, L. A., Henagan, T. M., Zanovec, M., Earnest, C. P., Johnson, L. G., Winchester, J., ... & Stewart, L. K. (2011). Endurance and resistance training lowers C-reactive protein in young, healthy females. Applied Physiology, Nutrition, and Metabolism, 36(5), 660-670. Dalbo, V. J., Roberts, M. D., Sunderland, K. L., Poole, C. N., Stout, J. R., Beck, T. W., ... & Kerksick, C. M. (2011). 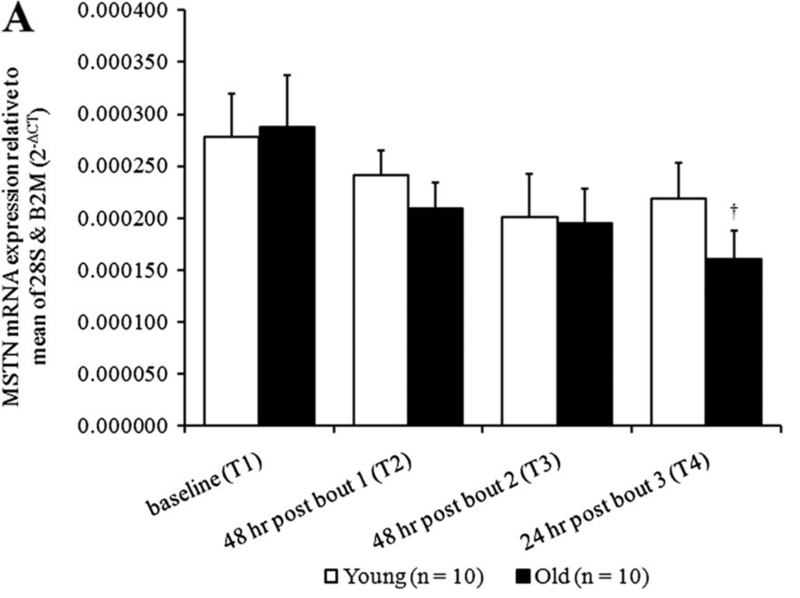 Acute loading and aging effects on myostatin pathway biomarkers in human skeletal muscle after three sequential bouts of resistance exercise. The Journals of Gerontology Series A: Biological Sciences and Medical Sciences, 66(8), 855-865. Leal, M. L., Lamas, L., Aoki, M. S., Ugrinowitsch, C., Ramos, M. S. C., Tricoli, V., & Moriscot, A. S. (2011). Effect of different resistance-training regimens on the WNT-signaling pathway. European journal of applied physiology, 111(10), 2535-2545.